The house now known as 23 Pullins Green in Thornbury adjoins the row of houses formerly known as Victoria Terrace. We haven’t seen the deeds of all of these houses yet. However, the deeds of number 19 show that they were all built by George Hodges, the Thornbury builder. Click here to read about the early history of the terrace. Number 23 was built in the late 1880s. The 1890 Rate Book shows it was occupied by James Pullen. We would be delighted to see the deeds of more of these houses to check on the date they were built and any other details which they might give. We would very much like to hear from the owners of the properties. George Hodges owned and let all these houses. After his death in 1905, the houses were managed and let by the Trustees of George Hodges’ Estate and this arrangement continued well into the 1950’s and later in the case of some of the houses. In the case of number 23, we know that Hubert Baylis was a tenant until at least 1958. Charles and Rebecca Wiltshire – in the 1899 Rate Book and the 1901 Census, the house was occupied by Charles Wiltshire, an assurance agent aged 46 from Westerleigh and his wife, Rebecca, aged 44 from Bitton. At the time of the Census they had five children: George Stibbs, an assurance agent aged 23 born in Pucklechurch, Arthur Charles Herbert, a plasterer, tiler and house decorator aged 19 from Pucklechurch, Caroline Blanche born in Pucklechurch in 1884, Beatrice Louise born in Thornbury in 1888 and Florence Agnes born in Thornbury in 1893. Charles was born in Westerleigh about 1855, the son of George Wiltshire a coal miner from Bristol and his wife, Charlotte who came from Uley. In 1861 Charles was living with his parents in Rodford, Westerleigh. By 1871 his father had died and Charles was living with his mother and he was now working as a coal miner. Charles married Rebecca Rawbone on 15th November 1873 in St Mary’s Church in Bitton. By 1881 they were living in Pucklechurch with their children: Martha aged 6 born in Westerleigh, Olive aged 4, and George S aged 3, and Emily Minnie aged 1 all born in Puckelchurch. On the left we show a photograph of Charles and Rebecca later in life. In the 1891 Census the family lived in Lower Bath Road, in the house which later became known as 12 Rock Street. Charles was now an insurance agent aged 36. Of their children, Olive had become a dressmaker’s apprentice aged 15, George Stibbs was a grocers apprentice aged 13, and Emily Minnie aged 11, Arthur Charles Herbert aged 9, Caroline Blanche aged 6, all born in Pucklechurch and Beatrice Louise aged 3 born in Thornbury. We believe Charles and Rebecca moved to Pullins Green in 1895 because the 1896 Voters’ List shows them moving from Outer Back Street (i.e. Rock Street). 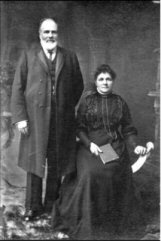 On 2nd July 1902, their daughter Martha Hariett Wiltshire married Cecil Walter Marchant of Slough at what is now the United Reformed Church in Thornbury. The 1911 Census shows Charles was an assurance agent working for the Prudential Assurance Company. Charles, Rebecca and Beatrice, then employed as a draper’s assistant, were still living in the same house. They had a visitor, Leah Tucker, a monthly nurse aged 42 from Pucklechurch. Charles carried on living in number 23 until his death on 28th May 1912 aged 57 years. In 1914, Florence Agnes married Frederick Rose in the Thornbury Baptist Church and they settled in Gloucester. The South Gloucestershire Chronicle of October 13th 1916 had the sad story of the death of Norman Marchant. He was the youngest son of Martha and Cecil Walter Marchant. The couple seemed to have lived in Birmingham after their marriage but after Cecil enlisted in the Royal Gloucester Artillery in the First World War Martha had come to live with her mother in Pullins Green. Although little Norman was only six years and ten months at the time of his death, the report says that he had been ill for over five years. Rebecca Wiltshire continued to live at 23 Pullins Green until her death on February 27th 1933 aged 76 years. Hubert and Margaret Baylis – the house was occupied by the Baylis family from about 1935 until after 1970. Hubert Lloyd Baylis, was baptised on 2 November 1890, the son of Albert Baylis, carrier and his wife, Sarah Ann (Annie) (nee Ashley). In 1891 Albert and Annie had been living at Crossways with Beatrice Annie aged 2 and Hubert aged 6 months. In June quarter 1897, Annie died aged 36, possibly in childbirth because there is record of a birth and death of a Christian Baylis in Thornbury in the previous quarter 1897. By 1901 the widowed Albert had moved to Sibland with his children Beatrice, Hubert, Albert Howard aged 8, Percy Ashley aged 8 and Adelaide Amelia aged 6. Albert died in 1906 aged 45 years. Hubert was a plumber and generally known as ‘Plumber Baylis’. He was member of Thornbury Football Club and played the euphonium for the Methodist Band. In 1934 Hubert married Margaret Hope Griffin who born in Hatherop in the Cirencester area on 15th July 1908. Hubert and Margaret had two children: Elwin John known as John and Margaret Ann. Both John and Margaret went to the Council School and then on to the Grammar School. John married the daughter of a dairyman from Compton Greenfield and became a milkman. In 1961 Margaret married a Scotsman, Ronald Prosser, whose father had moved to Thornbury as manager of the Forest and Orchard Nursery. The photo on the right shows Hubert and his daughter, Margaret Anne, at the time of her marriage. Hubert died on 11th May 1964 aged 73 years. Margaret died 27th March 1982 aged 73 years.